From head to toes, YES! 1. Sparkly Old Skool Vans in case you stylishly lean toward the abyss. But like, a sparkly abyss. Get them from Free People for $70 (sizes 6–10). 2. Shearling-lined Birkenstocks for some house slippers–like comfort without dirtying up your home go-tos. Get them from Amazon for $145+ (sizes 5.5–11.5) or Zappos for $164.95 (sizes 5–11). 3. And Minnetonka slippers lined with faux fur as a cozy step that'll be even closer to your actual house slippers. Get them from Amazon for $39.95+ (sizes 5–11, 24 more colors) or American Eagle for $39.95 (sizes 5–11, three more colors). 4. Fierce buckled options that'll provide the right amount of bite — to your outfit, not your toes. Get them from Amazon for $49.99 (sizes 4–11 and also in red). 5. Heeled combat boots ready to kick it in all senses of the phrase. Get them from Amazon for $29.93+ (sizes 5.5–11 and two more colors). 6. Lace-up boots for an extremely exclusive party in the back. Just your calves are invited. Sorry. No plus ones. Get them from Amazon for $36.99 (sizes 5–11, three other black variations, and 12 more colors). 7. Waterproof espadrilles in case you're super lucky and will be frolicking on a beach this season. Get them from Amazon for $88.95+ (sizes 6–11 and five more colors) or Nordstrom for $89.95+ (sizes 6–10 and eight more colors). 8. 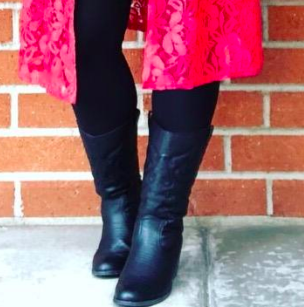 Frye riding boots in a classic silhouette you can wear to death. JK. As long as you take care of these puppies you can get them resoled and dolled back up for years and years of wear. Get them from Amazon for $109.99+ (sizes 5.5–11 and three more colors). 9. Studded shoes that'll be your new closet crush. Do you come to this bedroom closet often? Get them from H&M for $39.99 (sizes 4.5–10 and also in camel). 10. Dr. Martens 1460s you'll really and truly wear for years and years and years. 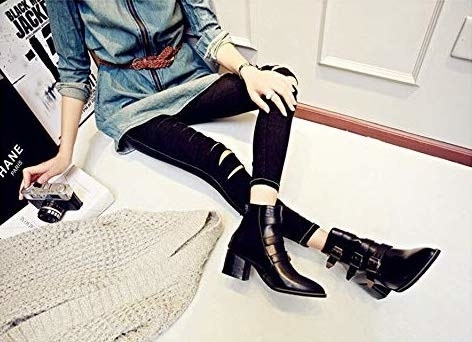 Get them from Amazon for $98.44+ (various sizes, three black styles, and nine other colors) or Zappos for $145 (UK sizes 3–15, three black styles, and three other colors). Also check out some floral embossed and platform versions. 11. Strappy boots to wear underneath your maxi or midi dress on days that aren't *too* frigid. Get them from Free People for $398 (sizes 5–10 and also in brown). Get the women's from Greats for $179 (sizes 6–7.5, 8.5, 9.5) or the perforated version from Nordstrom for $179 (sizes 7.5, 8). Get the men's from Greats for $179 (sizes 7–15). 13. Quilted beauts can give you some texture blocking when you're stuffed into your down coat for what feels like the 300th year. Get them from Amazon for $31.99 (sizes 6–10 and seven more colors). 14. Patent booties for a ~slick~ look when you pair them with anything, really. Get them from Target for $44.99 (sizes 5–12 and two more colors). 15. Platform Supergas as a fashion sneaker option that'll elevate you *and* your ensemble. Get them from Zappos for $79.95 (sizes 5–10 and eight more color combos) or Amazon for $39.99+ (size 6.5 with the black sole and sizes 5–10 in the white sole option). 16. 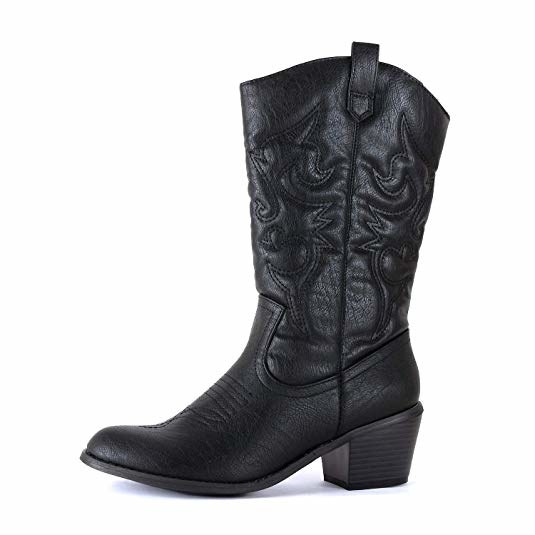 Cowgirl boots that'll make you wonder why the heck this is your first rodeo. Seriously, they'll go with everything. Get them from Amazon for $19.99+ (sizes 5.5–10 and 10 more colors). 17. 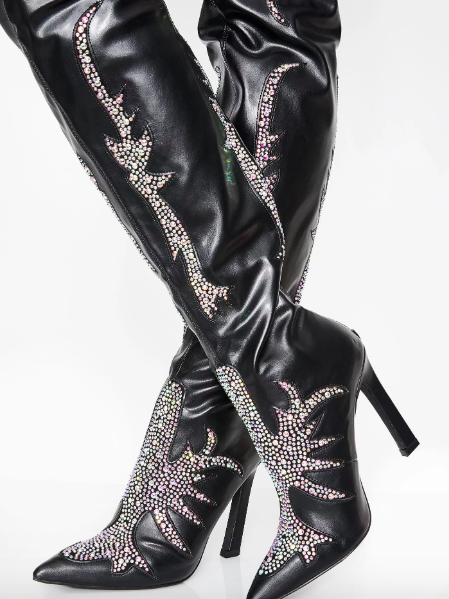 Or rhinestone cowboy thigh highs you can wear where hustle's the name of the game. Get them from Dolls Kill for $110 (sizes 6–11). 18. And while I'm at it, rhinestone hiking boots that may finally give your fave (absence of) color its time in the spotlight. Get them from Amazon for $109 (sizes 6–10). 19. Sporty Fila sock boots for those days when you feel like wearing some color. There's some red on these!!! Get them exclusively from Urban Outfitters for $80 (sizes 5–10). 20. Motorcycle boots that'll look hard but actually feel super comfy on your old dogs. Get them from Amazon for $37.99+ (sizes 5–11 and two more colors). Get them from Nasty Gal for $60 (sizes 5–10). 22. Rubber penny loafers for a rainy day fit when you just can NOT with wearing wellies for the fourth time this week. Get them from Hunter for $135 (sizes 5–11, five more colors). 23. Affordable Chelsea boots because they're a staple you'll find yourself reaching for on so many mornings with zero regrets. Get them from Amazon for $20.59+ (sizes 5.5–11 and three more colors). 24. Rain ankle boots in the same Chelsea silhouette no one will suspect are actually rain boots! Another BuzzFeed writer owns and adores these! Read our full review of the Sam Edelman Tinsley rain boots (#2). 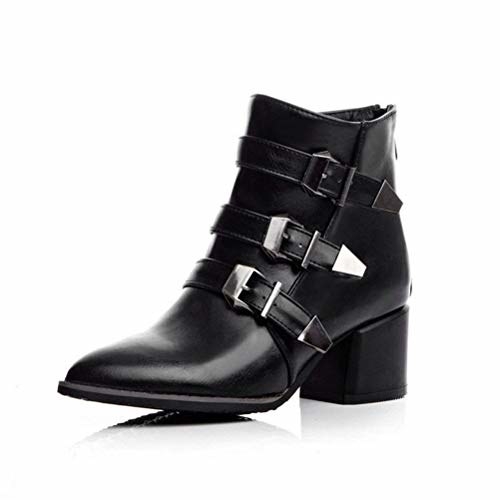 Get them from Amazon for $26.99+ (sizes 5–13 and polished black). 25. And fun wedge boots for when you wanna level up that look. Get them from H&M for $49.99 (sizes 5.5–10). 26. Sweet Mary Janes to layer with all those colorful tights in the back of your sock drawer you've been neglecting. Get them from Amazon for $18.99+ (sizes 5.5–11 and in a variety of other colors, styles). 27. Gorgeous kitten heels wrapped up neatly in a bow for the kitten heel haters to finally admit that they're a chic look. And by "kitten heel haters" I specifically mean my friend Aaron who calls every non-stiletto heel a kitten heel just to annoy me. Get them from Loeffler Randall for $395 (sizes 7–11.5, also available without a bow and a ruffled ankle opening in sizes 5.5, 7–11). 28. Italian leather loafers you can keep at the office for those days when you have to wear snow boots on your commute but want to walk around in normal shoes indoors. These are the shoes you can invest in now, wear a ton, and then get resoled multiple times over the years. They're that good. Get them from Everlane for $168 (sizes 5–11, patent leather, and nine more colors). 29. Mesh sock booties for when you need to wear some stilettos but yearn for a lil' bit of coverage against harsh winter gusts. 30. Cute sneakers that have a few dad sneakers tendencies, but aren't full-on in case you'll never completely get on with that trend. Get them from Target for $34.99 (sizes 5.5–12 and two more colors). 31. Platform oxfords as a way to honor your fave flat style while gaining a few inches on the sartorial competition. Get them from Amazon for $79.55+ (sizes 5-12 and one more color). 32. Washable flats that'll be on pointe for many seasons to come because they're a classic shape that'll hold up for the long haul. I've tried these and they're ooooooh so comfy. And do wash very easily. Legit! Get them from Rothy's for $145 (sizes 5–12). When your friends don't get your obsession with all black, everything.